Mid-April is probably not a time when you’re thinking about back to school, but at Showbie headquarters it’s top of mind. Our product team is heads-down focused on delivering some pretty slick new features for back to school this fall and we wanted to give you a sneak peek at what’s coming. Most of these improvements are based on direct feedback from users, and are geared toward creating a better Showbie for teachers like you. So whether it’s helping you keep better track of your assignments, provide more meaningful feedback, or personalize messages for a subset of your class, we hope you’ll enjoy using these core-workflow enhancements. 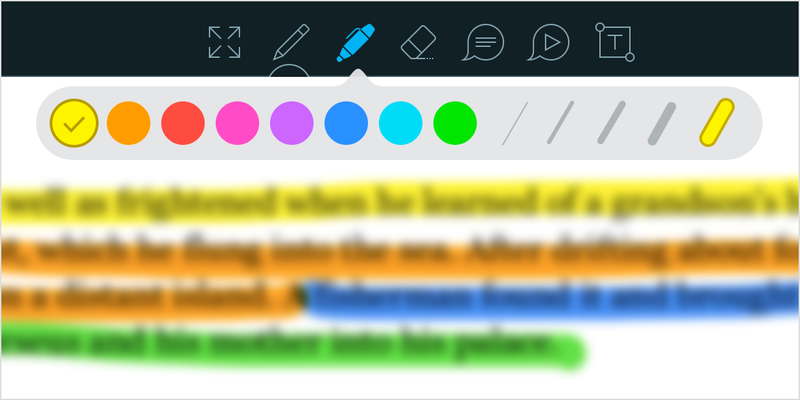 Showbie’s built-in annotation and feedback tools are getting even more versatile, with the inclusion of a vibrant new highlighter pen. Call attention to details in an eye-catching new way, without worrying that the original work will be obscured by your scrawl. How many assignments do you have active in Showbie right now? Chances are, the more you use and love Showbie, the more assignments you have, to the point where it might be a bit of work to stay organized. The class folders feature is designed to make life with assignments much easier! If you’re a primary teacher with one or two classes and a variety of subjects in each class, you can group your assignments by subject. Create folders for reference materials or key ongoing projects, to keep them separate from the flow of daily or weekly assignments, making them easier for students to find. Organize your class around curriculum units or topics, or by weeks or months in the semester. Group similar types of assignments, like homework, in-class exercises, and quizzes, together in one location. Students love voice notes for language, reading, and music assignments, and teachers love them as a way to provide fast and highly personal feedback. Voice notes are getting even better with an improved interface, allowing you to pause and resume recording, and keeping the screen clear so you can have a clear view of documents and assignments while recording. From the very start, Showbie has provided an easy way to distribute materials and instruction to your entire class, and to provide personalized feedback or differentiated instruction to individual students. But what if you want to provide differentiated material to several students within your class at the same time? Currently this involves some manual repetition as you send material to each of these students individually. With our new differentiation tools, you’ll be able to select a group of students, sending materials and messages as easily as you would the whole class. 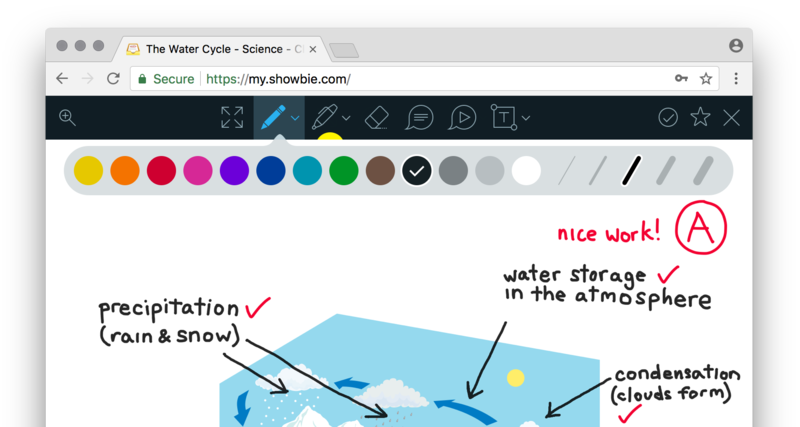 Showbie’s full suite of feedback tools, including the pen and highlighter, are coming to my.showbie.com for back-to-school. So whether you and your students are on iPads, Chromebooks, MacBooks, or Microsoft Surface Tablets, you’ll have access to the same indispensable features. Attending Bett London? Pop by and say hi! Showbie 3.6 – New Year, New Features!